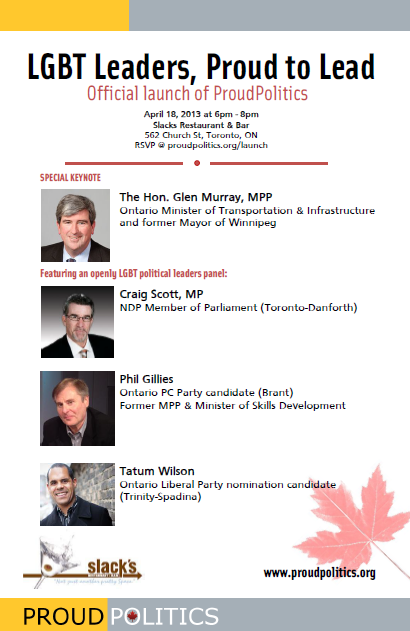 Join us for "LGBT Leaders, Proud to Lead" - the official launch of ProudPolitics - Canada’s only multi-partisan LGBT organization aimed at electing emergent LGBT leaders to all levels of government. and other distinguished LGBT public officials, candidates, and appointed leaders. Join us for some refreshments & networking. Let’s begin the cross-partisan discussion on the roles, challenges, and barriers of LGBT candidates and officials. We would be honoured to have you there!